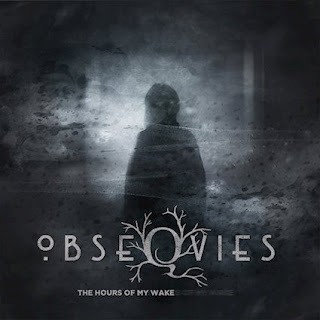 Obseqvies are a band from the Netherlands that plays a mixture of drone and atmospheric funeral doom metal and this is a review of their 2018 album "The Hours Of My Wake" which will be released on June 30th by Rain Without End Records. Atmospheric sounding drones start off the album along with some symphonic synths a few seconds later which also mixes in with the heavier sections of the music while the slow riffs are very heavily rooted in funeral doom metal along with the vocals also bringing in a great amount of deep guttural death metal growls. All 3 of the tracks are very long and epic in length while the riffs also bring in a small amount of dark and depressive sounding melodies along with a brief use of spoken word parts as well as some black metal screams also being utilized at times and when guitar leads are utilized they are done in a very melodic style, clean playing can also be heard at times and as the album progresses a brief use of clear vocals and stringed instruments can be heard and all of the music sticks to a very slow direction. Obseqvies plays a musical style that takes drone and atmospheric funeral doom metal and mixes them together to create a sound of their own, the production sounds very dark and heavy while the lyrics cover eternal darkness and doom themes. In my opinion Obseqvies are a very great sounding mixture of drone and funeral doom metal and if you are a fan of those musical genres, you should check out this band. RECOMMENDED TRACK "Dawning". 8 out of 10.